Each of these Mini-Olios will be 20 minutes long with time for a short Q&A in between. Dada emerged in Zurich in 1916 as a reaction to the catastrophic violence of World War I, the blind futurism of the artistic movements that preceded the war, and the false notions of progress that governed both. “What we are celebrating is both buffoonery and a requiem mass,” poet-artist Hugo Ball said of the Dada events that he and other artists, writers, and filmmakers organized in rejection of modern society. These events, and the Dada disgust that they manifested, reveal the horrors and absurdities of progress. The rise of industrial society and its new and distinctive form of mass production created the corollary need for mass consumption. They are two sides of the same economic coin. One of the main questions economists have pursued is understanding the dynamic between supply and demand in pursuit of some perfectly balanced free market. So ten thousand years of human development have at last produced the combination bagel toaster & egg poacher (take that, Angkor Wat and Sphinx!) The final victory of planned obsolescence? In recent years, some conservative and neoliberal academics have touted the idea that human societies are evolving toward a less violent state. Progress, such scholars claim, is an inherent quality of our species, and history moves in one direction. But what if the notion of progress itself is in fact our most enduring fuel for violence? Let us look closely at the myth of historical progress and ask ourselves just how we came to believe that the past exists in service to the future. 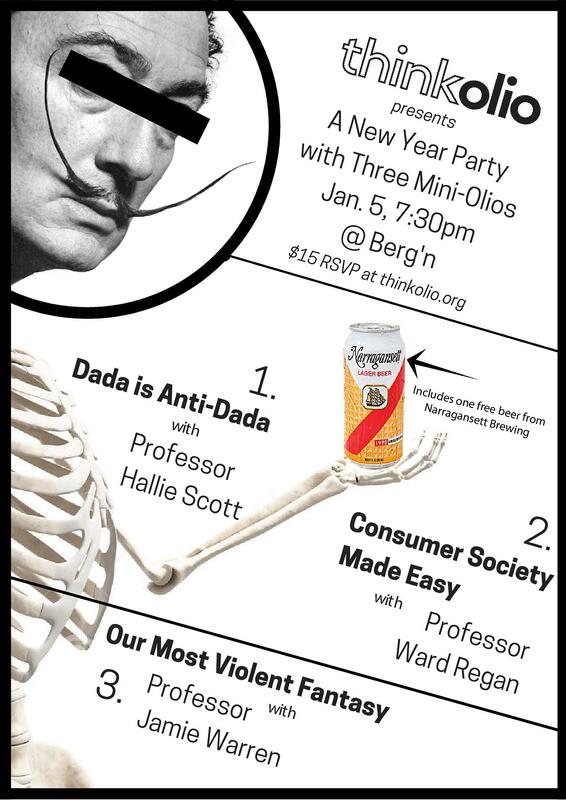 This will be an epic evening that consists of three, 20-minute Olios from amazing professors, delicious beer, and a brand new perspective on what it means to make progress. Is new synonymous with progress? As a species are we evolving? Devolving? Staying stagnant? Coming from the backgrounds of Art, History, and Philosophy these professors will join up to give us their unique takes on the idea of progress and give us plenty of reasons to question this so called new year. Ticket includes one free beer from Narragansett Brewing.